SendAFrame, Inc. (www.SendAFrame.com), the leading online retailer of fashion picture frames and photo albums, announced today the launch of the world's first one-minute shopping for CustomCut© collage mat and picture frames of any size -- at prices up to 50 percent below traditional retail. New York, NY (PRWEB) May 22, 2012 -- How can an person easily buy the same multiple cut-out mats and custom-made frames that business decorating professionals use? 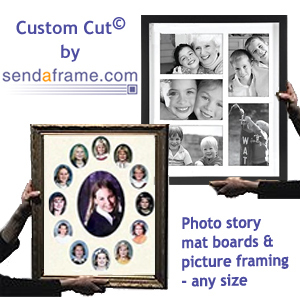 SendAFrame, Inc. (www.SendAFrame.com), the leading online retailer of fashion picture frames and photo albums, announced today the launch of the world's first one-minute CustomCut© collage mat and framing shopping service -- at prices up to 50 percent below traditional retail. With over 1,500 multiple cut-out mat patterns available, clients achieve professional collage results that were previously available only from storefront retailers. Over 140,000 square feet of production facility is devoted to serving customer orders. Unlike the old-fashioned 2-3 week "order and wait", SendAFrame CustomCut© frame orders are shipped in 3 business days or less. "Our goal is to make the process of ordering custom photo story collage frames both easy and affordable" said SendAFrame CEO Steve Bochner. We've taken a process that used to require at least 1-2 hours of work and reduced that chore to a minute of shop-click-order. SendAFrame's CustomCut© total eliminates the need to measure and draw, without the worry that too often resulted in disappointment. Customer reaction in our first days of deliveries has wildly exceeded everyone's expectations." An invaluable service for anyone wanting to display a framed, archival arrangement of various sized items (tickets, photos, letters, autographs or certificates to name a few). Professionally cut and delivered assembled, SendAFrame CustomCut© collage mats and frames become the pride of customer homes and offices. Customers just add photos and hang. Over 200 styles of wood and metallic picture frame mouldings from mills around the world are presented in SendAFrame's easy to use webstore. The company has a 110 percent price guarantee. The webstore is fully safety compliant, with certificate and advanced encryption features, including the prestigious American Express Platinum status. Visit: http://www.SendAFrame.com/CustomCut to learn more about collage mat and picture frame shopping. SendAFrame.com makes the process of finding, selecting and purchasing a unique gift fast, easy and hassle-free. Billed as America's largest online frame selection, shoppers can choose from an array of stylish, designer frames at all price points, all in one place. Several features guide customers through the gift selection process. Some of the featured brand names include Kate Spade®, Lisa Jenks Home®, Lunt Silversmiths®, Thistle & Bee® sterling, Reed & Barton®, KOLO®, Edgar Berebi®, Orrefors®, Waterford®, Belleek® china and museum collections of the Metropolitan Museum of Art and MoMA®. Prices range from $12.00 to over $750 for one-of-a-kind gift collectibles. From one piece to 10,000, SendAFrame's five nationwide warehouses are able to handle any size order with ease. With SendAFrame, customers can send high quality personalized gifts in just a few easy steps: transfer a digital photo to SendAFrame via any Internet connection, preview the photo in a frame online and purchase the finished framed picture. Personalizing, including same-day silver and pewter engraving and leather embossing, is available for a nominal charge. SendAFrame typically ships its customers' ready-made gift wrapped picture frames and photo albums in about two hours. Delivery is free via FedEx for orders over $50.00.